Today is the saint's day of Saint Isidore of Seville. 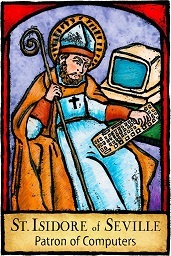 In 1997 Pope John Paul II, of the Catholic Church, decided that computers and the internet needed a patron saint. His choice was St Isidore of Seville, "the last of the great scholars of the ancient world". I hope you all have a good St Isidore Seville day. But if you need divine intervention for your computer problem this is the day could be the right day to ask for divine inspiration. To learn more about St Isidore of Seville see here. I need to say "St Isidore of Seville" rather than just "St Isidore" as there is another saint of the same name, "St Isidore the farmer", who is the patron saint of farm workers and the communities they live in.